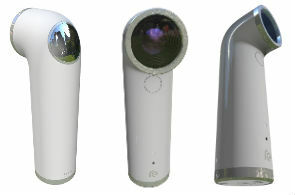 HTC RE to Rival the GoPro? The GoPro range of action cameras have always dominated adventure sports, but HTC have now announced the RE, a waterproof, wide-angled digital camera, aimed at the same market. The cylindrical RE is 9.7cm (3.8in) tall and weighs just 65.5g (2.3oz), making it marginally lighter than the GoPro cameras, which weigh in at around 75g naked and 150g in their protective casing. The RE though is considerably taller and less conventional looking � more of a mini-periscope. Like the GoPro it lacks playback screen but can be paired wirelessly to apps on smartphones and tablets. The RE features just two buttons: a short tap on the base button takes a photo, whilst a longer press starts/stops video recording and a side button is used to change functions such as selecting slow-motion and time lapse. The camera is 16MP compared to the GoPro HERO4�s 12MP and is capable of shooting in 1080p high-definition video at normal speed, and 720p in slow-mo. The RE is bound to find a market, but rival the GoPro? That very much remains to be seen.